When I first told my girlfriend I was reviewing Okami HD, she asked what it was about. When I replied that you play as a Sun God reincarnated as a white wolf that battles evil spirits with a celestial paintbrush, she was rightly confused. Okami is one of those stories that could only be told through video games. Distracted by the gorgeous graphics, fast action and enthralling exploration, you might not notice just how nonsensical the story is. And this isn’t even the first reincarnation of Okami either, as the original release was back in 2006, but with the remastered graphics and timeless artwork, you can hardly tell from looking at it. Despite Okami feeling like it has the same reverence as other titles of the same era, this is the first time it’s been remastered since a Wii version came out nearly a decade ago. Which, given its truly iconic style, makes it even more remarkable that they’ve only just remade it for the current generation. 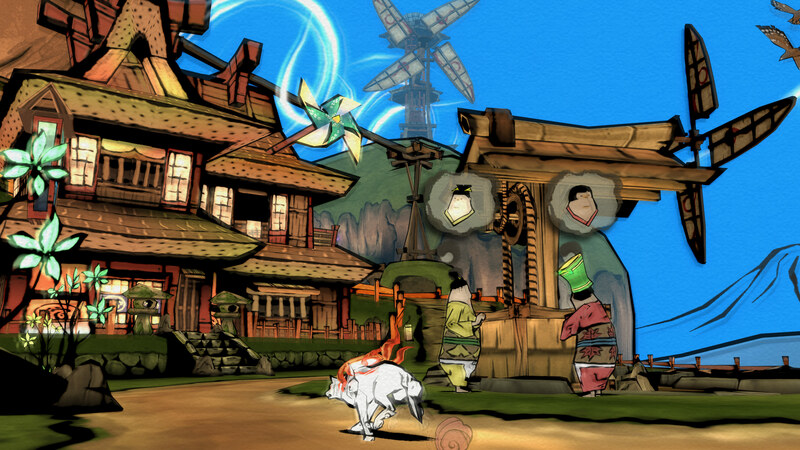 Playing Okami HD once again teleports you into a world of watercolors and hand-painted beauty. Like The Legend of Zelda Wind Waker, there is something distinctive in the presentation of the game that makes it so easy to look fresh and at the same time completely impossible to imitate. It’s not perfect, as some objects in the game only exist in 2D, but it’s still a striking design. Okami is an unmistakably unique title, and its art style alone is almost worth overlooking the extremely annoying bug that the developers didn’t even try to hide. His name is Issun, he’s an inch high ‘wandering artist’ and will not leave you alone for the entire adventure. He is also the most obviously telegraphed sign that this game was made in the 2000’s. Through his unsubtle directions, tutorials and advice, to his inability to stop talking, I found his inclusion in the game nothing but an irritating distraction that ruins the flow. Broken up into small areas by today’s comparison, the player has the chance to explore the environment while encounter evil spirits to fight. These battles are done in a smaller arena landscapes, but the transition is next to seamless. Other than that, the majority of the game is spent trying to scroll through all of Issun’s dialogue as fast as possible. Right from the beginning he feels like a leash around the player’s neck, constantly, patronizingly telling the player what to do, where to go and why. After the early tutorial stage in the tree that is also in space, he continues to steer the player and the God wolf throughout the adventure. For younger players like myself when this game first released, I’d tolerate this for valuable information, but as a more mature gamer, it’s just annoying. No one needs to be reminded of the objective every few seconds. Beyond the little pest that sits on your head, Okami HD is the hallmark of an era, complete with a bonkers plotline thinly veiled excuses for action. Playing as a wolf, you spend a good deal of your time platforming in the stunning 3D environment. Navigating literally picturesque, exaggerated landscapes was the biggest highlight for me, but the action and the use of the celestial brush aren’t to be overlooked. The celestial brush is used both in combat and exploration as the player can pause the game at any time and graffiti all over it. Granted, any doodles you might decide to make probably won’t have any effect on the game, but occasionally they’ll be there to solve very basic puzzles. And that’s possibly being generous to call them puzzles, which include things like drawing a sun in the sky to make it appear. In combat, these brush techniques are mainly used to deal damage, slashing at enemies to finish them off. The controls aren’t quite as satisfying as they were on the Wii where you physically swiped at the screen, though. Even on the PlayStation 4, where you can in theory use the touchpad, the experience just isn’t as good. But despite the giant glaring “bug” and slightly less graceful brushwork, Okami is still a masterpiece of art design in games, and just plain fun to play. You might not understand the story unless you know a lot about Japanese mythology, but the action, platforming and puzzle elements are all simple enough and just built to be enjoyed. Although the celestial brush might be different, nothing in this game is designed to be challenging or overwhelming. You should really be able to enjoy Okami HD for the visuals alone, but if you can’t, everything but the sidekick is fun, too.